Learn how to report and record your accomplishments in the lab with this sample resume for a medical technologist. To be considered for top medical technologist jobs, it helps to have a comprehensive resume that displays your skills and experience. Want to report and record your accomplishments in the lab more effectively? Check out the sample resume for a medical technologist below, and download the medical technologist resume template in Word. Jobs for medical technologists are projected to grow by 13% (or 42,700 jobs) from 2016 through 2026, which is faster than average, according to the Bureau of Labor Statistics (BLS). You'll find the highest level of employment for this job in the following states: Texas, California, Florida, New York, and Pennsylvania; and in the following metropolitan areas: New York City, Boston, Chicago, Los Angeles, and Houston. As a medical technologist, you can expect to earn a median wage of $51,770 per year, or $24.89 per hour, according to the BLS. Experienced medical technologist with ASCP certification, three years of experience as an NYU Medical Center lab technologist and bachelor's degree in medical technology. Searching for a medical technologist position in Chicago, IL. Excellent clinical laboratory skills, with commended performance conducting/analyzing laboratory assays and resolving complex clinical and instrument problems. Collect and prepare specimens and perform laboratory procedures used in the diagnosis, treatment and prevention of disease. Verify, record and report lab results on all performed tests. Ensure compliance with government requirements, hospital policies and laboratory procedures, including maintaining the cleanliness of lab equipment, instruments and work area. Executed and analyzed tests in areas including chemistry, hematology, urinalysis, serology, histology and bacteriology to aid physicians in diagnosing and treating disease. Consistently commended for the timely, high-quality completion of both routine and special laboratory assays of patient specimens (including blood and other body fluids, skin scrapings and surgical specimens). Ensured test-result validity before recording/reporting results, earning a reputation for meticulous attention to detail. Evaluated quality control within laboratory using standard laboratory test and measurement controls, and maintained compliance with CLIA, OSHA, safety and risk-management guidelines. Completed 15-month clinical training program at St. Vincent's Microbiology Department. Operated and calibrated an assortment of laboratory/testing equipment and performed various chemical, microscopic and bacteriologic tests. Available for all shifts and extended work hours. Relocating to Chicago, IL. Before you submit your resume to job ads, you want to make sure that it contains the right keywords and phrases that will stand out to hiring managers. Could you use some help with that? 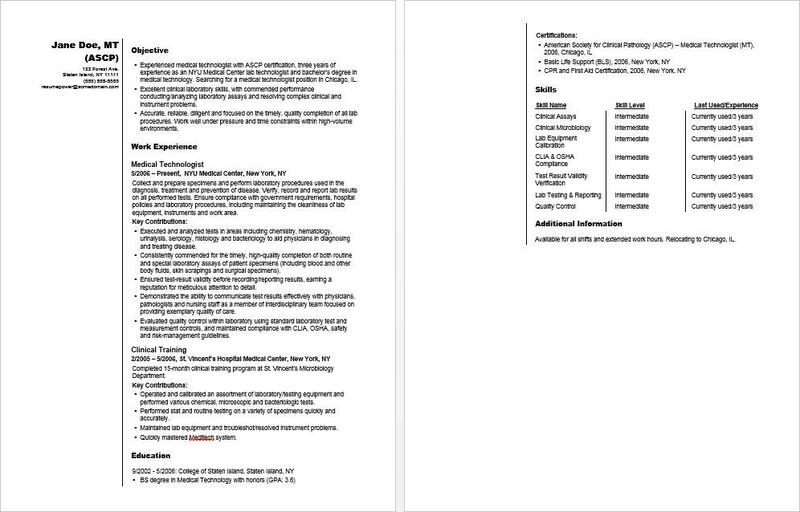 Get a free resume evaluation today from the experts at Monster's Resume Writing Service. You'll get detailed feedback in two business days, including a review of your resume's appearance and content, and a prediction of a recruiter's first impression. We can help your resume get in optimal shape for the job search.